It was a warm August evening, and I was standing in the kitchen making dinner. Why the kiddos were watching a Christmas movie in August...I will never know. But I will always be glad they did. In The Toy that Saved Christmas, the grandpa asparagus is telling the grandchild asparagus about the first Christmas. "So Mary gave birth to the baby Jesus and wrapped him in baby clothes." Wait a second...wait one cotton-picking second. The KJV didn't say "baby clothes". It said "Swaddling Clothes." That's when I started thinking. What are the swaddling clothes? Are they really just baby clothes? But if they were, why was it mentioned twice in the Scriptures that this would be a "sign" to the shepherds? Wouldn't the shepherds expect a baby to be wrapped in baby clothes? No one really knows when the idea of swaddling clothes first began, because it is a tradition as old as history itself. What most historians believe to be the first record of swaddling babies dates back to the Bronze Age, more than 4,000 years ago. Votive offerings appear to depict babies swaddled tightly. 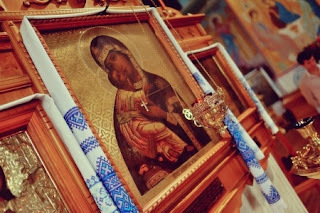 In Greece and Rome there are also statuettes found in the tombs of women who died in childbirth that show babies in swaddling clothes. It was believed that if a baby was wrapped tightly from birth, it would help their limbs grow straight and strong. The tight wrapping keeps the child warm and also helps the them feel secure and safe. In some cases, special cloths were woven by monarchs and the wealthy for their newborns. All this is interesting, but still doesn't explain why the swaddling clothes would have been a sign to the shepherds as recorded in Luke 2. So I dug deeper. One theory, is that the swaddling clothes portrayed the humility and humanity of the Messiah...but this didn't necessarily line up with the other research, since wealthy people also swaddled their infants. A reference in Catholic history makes mention of King Solomon being wrapped in swaddling clothes. Perhaps the swaddling clothes were indicative of his lineage from King David? I found another article that suggested the swaddling clothes were actually strips of cloth that were typically used in burial rites. Since travelling was treacherous, the travelers would often keep these strips of cloth in case they needed them to bind up wounds, or even bury someone along the way. The article suggested that perhaps Mary and Joseph had nothing else to wrap the child in, so they used these cloths. Another reverend attested that what the Bible referred to as swaddling clothes was not meant for humans at all. It was a strip of cloth that was used as a buffer between the ox and his harness so that the harness would not rub against the animal's shoulders. Thus, Jesus being wrapped in this cloth signified the sacrifice that He would bear for our sins. There are many more theories, but these were the ones that stood out as most interesting to me. When I wrote The Swaddling Clothes, I ended up using a combination of several of these theories. It was a lot of fun to imagine the significance of this Scriptural mention. Have you ever wondered about The Swaddling Clothes? Have any stories of Swaddling Clothes been passed through your family history? 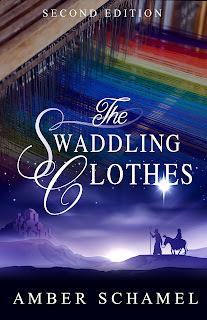 Leave me a comment to get your name in the drawing for a kindle copy of The Swaddling Clothes! Through the ages, men have told many stories about Mary, Joseph, and the birth of the Messiah. Stories of shepherds and sheep, kings, angels, and stables. But one story no one has ever told. One story hidden in the fabric of time. The story of The Swaddling Clothes. Only $.99 on Amazon for a limited time! This was an interesting article. Thank you for the chance to win a copy of this book. It sounds like a good one. Thanks for stopping by, Susan! I'm glad you enjoyed the article. Best wishes in the giveaway. Thanks for stopping by, Kim! Hey Bianca! I'm so glad you enjoyed the post. Thank you for stopping by, and leaving a comment! I have your name in the drawing. I love the idea of this book. I hadn't realized there were so many thoughts on swaddling clothes. I don't have any stories about this - but it sounds so neat from the Bible when they wrap Baby Jesus in swaddling clothes! Merry Christmas. Thanks for stopping by! The many theories are so interesting to me as well. One thing is for certain, something is significant about Jesus' wrappings...maybe just that He was our Lord, wrapped up tightly as a Christmas gift to the world. Merry Christmas to you as well! I've got your name in the drawing. Very interesting about the swaddling cloths. It's a subject I've pondered over for a long time. Glad you stopped by and enjoyed the post, Sally! I've got your name in the drawing. Thanks for stopping by! This definitely sparks your interest to another wonder of the signifticance of each part of the telling of Christ's birth. Thank you for the opportunity to win a copy of your book! I'm excited to read it! So glad you enjoyed the article! Thanks for stopping by. I have your name in the drawing. Hello, Amber. I truly appreciate all of the research that you put into finding the truth. I am a researcher at heart and can get lost in the little details sometimes. Sometimes it's those little details that lead to the best story - just like the swaddling clothes.